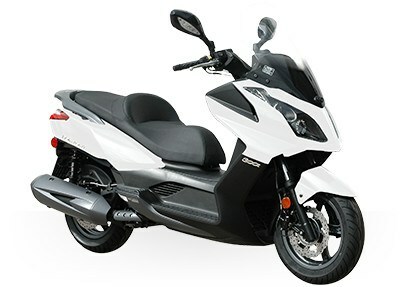 The 2017 Downtown 300i is the perfect ride for the urban warrior insomuch as it combines the open road performance of a maxi-scooter with the agility of a sport bike. This mid-range displacement cruiser is powered by a 298 cc, 4-valve, fuel-injected engine mated to a lightweight dual-cradle steel chassis and a smooth-shifting CVT automatic transmission. Dual-beam quartz Halogen lights illuminate city streets and the lighted under seat storage is perfect for storing helmets or backpacks. Top it all off with a 5-in-1 ignition key lock and gas cap system and you’re ready to go downtown in style.